Amazon S3 Bucket Logging. How to configure Server Access Logging. Amazon S3 access logs format. Amazon S3 Logging. How to Configure Amazon S3 Bucket Logging. Amazon S3 Access Logs Format. Amazon S3 Logging. An Amazon S3 bucket can be configured to create access log records for the requests made against it. An access log record contains details about the request such as the request type, the resource with which the request worked, and the time and date that the request was processed. Server access logs give bucket owners insight into the nature of requests made by clients not under their control. By default, server access logs are not collected for a bucket. With S3 Browser you can easily turn on Amazon S3 Bucket Logging. 1. 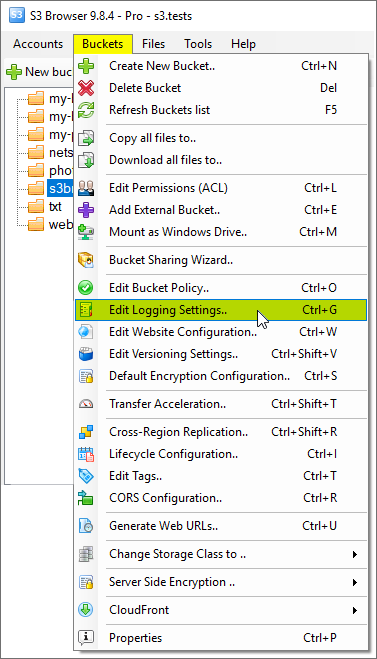 Select the Bucket you want to enable logging for and click Buckets -> Edit Logging Settings. 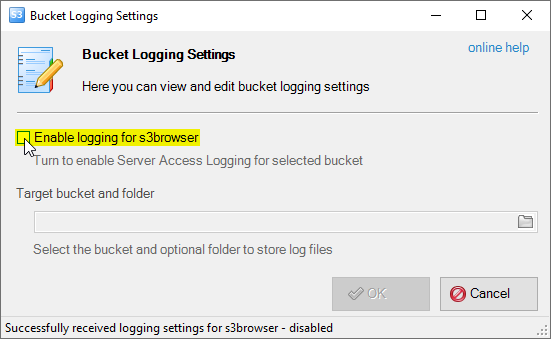 Turn on Enable logging for bucket checkbox. Then you need to specify Target Bucket and Target Prefix. Target Bucket - defines the bucket, where log files will be stored. Target Bucket should be in the same region as Source Bucket. If you want to use the same bucket for log files, we recommend to specify Target Prefix, including trailing slash, to keep log files in subdirectory and avoid mixing log files with other files. You may select existing bucket from drop-down list, or specify new bucket name and it will be created automatically. Target Prefix - defines a prefix for the keys that the delivered log files will be stored under. For example if you want to use one bucket to keep log files from multiple source buckets, you may use Target Prefix to define subdirectories for each buckets' log files, i.e. Bucket1-logs/, Bucket2-logs/. 3. 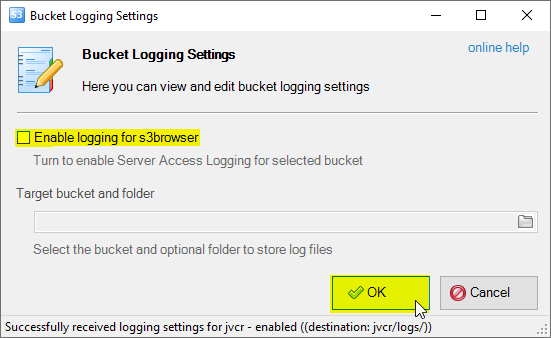 Click the OK button to save bucket logging settings. Please note, that log files does not appear immediately. There is some delay between the time when request was made and when it will appear in the logs. 1. Select the bucket, you want to disable logging for. 3. 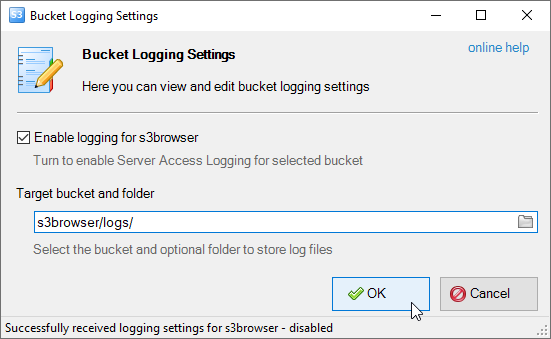 Turn off Enable logging for bucket checkbox. 4. Click the OK button to save changes. The log files consist of a sequence of new-line delimited log records. Below is an example of typical entries from Amazon S3 Server Access Logs. Bucket Owner 314423094967345b38a76d76d78c678b4 The canonical user id of the owner of the source bucket. Bucket bucket_name The name of the bucket that the request was processed against. Time [14/Nov/2010:13:53:47 +0000] The time at which the request was received. Remote IP 11.22.33.44 The apparent Internet address of the requester. Requester Anonymous The canonical user id of the requester, or the string "Anonymous" for unauthenticated requests. 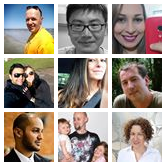 Request ID 3E43423453A12F47 The request ID is a string generated by Amazon S3 to uniquely identify each request. Operation REST.GET.OBJECT Either SOAP.operation or REST.HTTP_method.resource_type. Key s3browser/2.4.5/s3browser-2-4-5.exe The "key" part of the request, URL encoded, or "-" if the operation does not take a key parameter. Request-URI "GET /s3browser/2.4.5/s3browser-2-4-5.exe HTTP/1.1" The Request-URI part of the HTTP request message. HTTP Status 200 The numeric HTTP status code of the response. Error Code - The Amazon S3 Error Code, or "-" if no error occurred. Bytes Sent 543664 The number of response bytes sent, excluding HTTP protocol overhead, or "-" if zero. Object Size 543664 The total size of the object in question. Total Time 116 The number of milliseconds the request was in flight from the server's perspective. Turn-Around Time 96 The number of milliseconds that Amazon S3 spent processing your request. Referrer "http://s3browser.com/download.aspx" The value of the HTTP Referrer header, if present. User-Agent "Mozilla/4.0 (compatible; MSIE 6.0; Windows NT 5.1; SV1)" The value of the HTTP User-Agent header. Version Id - The version ID in the request, or "-" if the operation does not take a versionId parameter.